After a great session of chin ups, see saw presses and push ups, I stuck around the gym to attend the Rock Hard Abs and Bottoms class. The usual instructor Elena was not there and a substitute was in her place. I contemplated attending the class (I really like Elena’a class) but decided to give the sub a try. I’m glad I stayed for the class. The substitute instructor was very good and gave us a great session of abdominal work and lower back strengthening. After the gym, a well deserved treat was in order. I headed over to meet a friend at the Second Cup and enjoyed a festive coffee and almond chocolate biscotti. 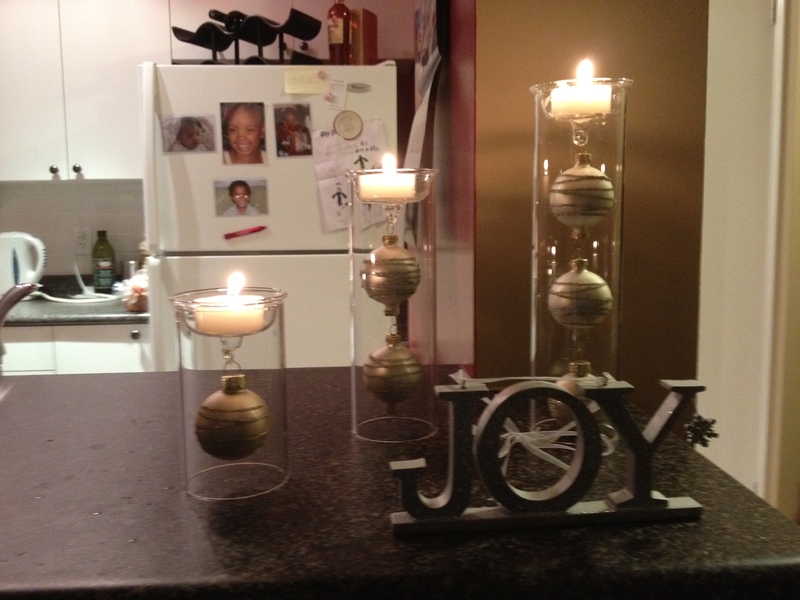 Later, my lack of holiday decor made me head to the shops where I found a few things to make my living space more merry and bright. 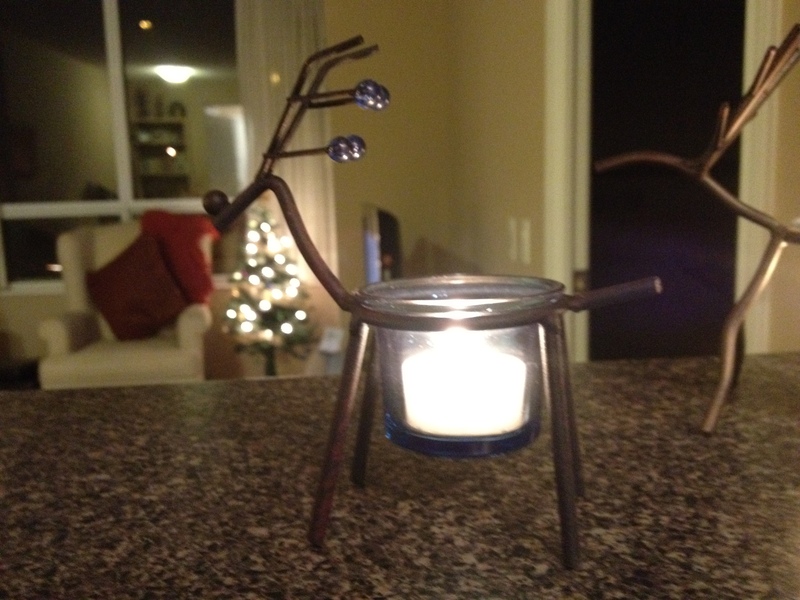 I found these cool reindeer candle holders at Kitchen Stuff Plus. 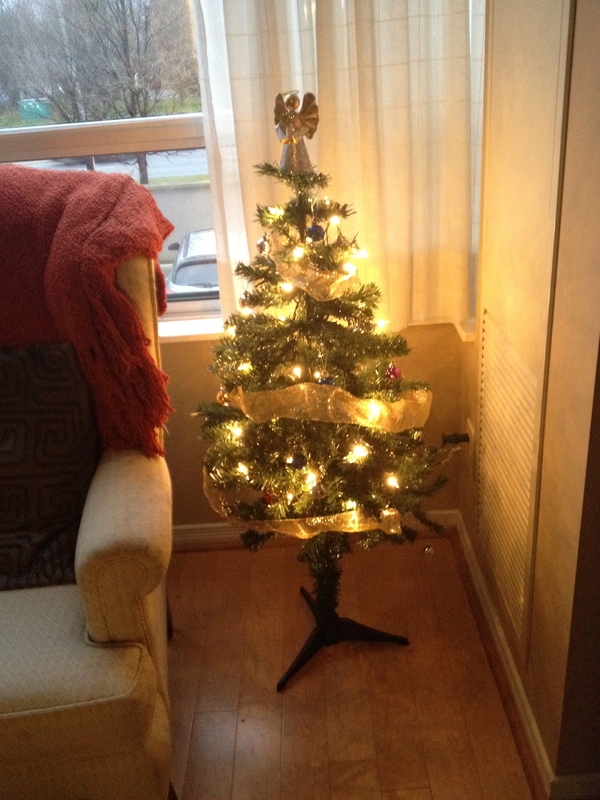 After weekly grocery shopping, it was time to deck the halls. Decorated my living space sipped on a glass of red wine (yes, yes, just one) while watching Rosemary Clooney and Vera Elen sing “Sisters” in my fave classic White Christmas. Never underestimate the Charlie Brown Tree. Give it a little love and presto chango! Rudolph the red-nosed reindeer had a very shiny body. Andy’s favourite ornament. 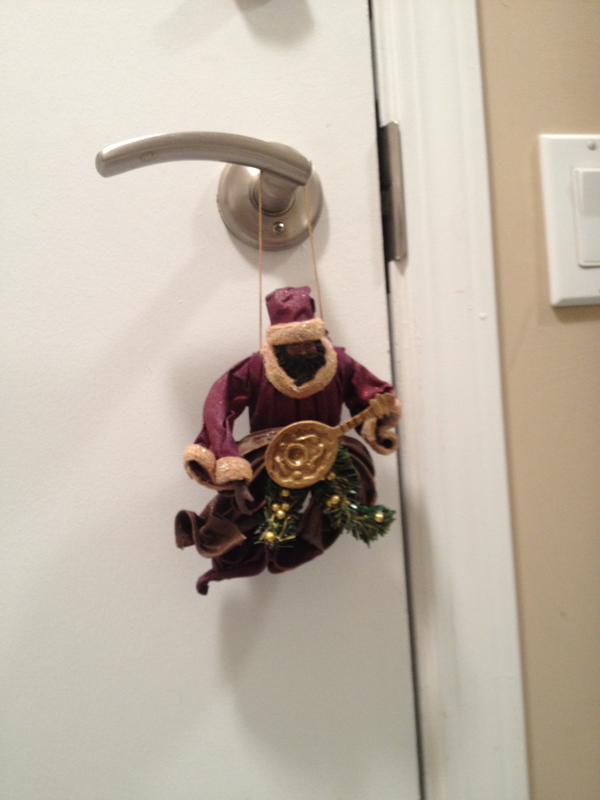 Black, musician Santa. It’s beginning to look a lot like Christmas around these here parts and I truly love it. Love the decorations! Your place looks so cute!!! Also, be prepared to watch “White Christmas” again soon with me! Thanks a lot. I got inspired from your blog. Can’t wait to do the sisters routine again. Can I be Rosemary?? Love the decor and especially the Charlie Brown Christmas Tree! Your place looks very festivus and cozy! I want in on the Sisters act too! Thanks Fran. Yes, all CB tree needs is TLC. We can’t let a season pass without Sisters. God help the mister who comes between me and my sister, and God help the sister who comes between me and my man! Lol.